Vroom, vroom! Chippewa Men's 25290 Brown Soft Toe Engineer Work Boots are built to make it happen! The bike, the wind in your hair, the open road, and the best men's boots around. Just lean back, put your feet up, and enjoy. 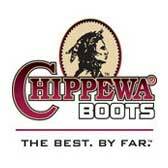 Here's what you get: Chippewa boots t ... (see full details) (see specifications) #CHP25290. Vroom, vroom! Chippewa Men's 25290 Brown Soft Toe Engineer Work Boots are built to make it happen! The bike, the wind in your hair, the open road, and the best men's boots around. Just lean back, put your feet up, and enjoy. Here's what you get: Chippewa boots that are durable and ready for action. They have a drill vamp lining (manufactured with drill cotton), padded footbeds for comfort and dryness, triple-ribbed steel shanks. Goodyear Welt sole construction is utilized, with Vibram 132 lug yellow plug non-marking oil- and slip-resistant soles, some of the best money can buy. And better yet, these brown boots are constructed in the USA. This lace-up footwear feature bay apache uppers to give you exceptional abrasion-resistance. 4 iron rubber/6 robus combination midsoles lend your feet additional support, while the soft, cushioned insoles keep your feet feeling great. The softness of them will help you get through your busy work days! Non-tarnishable, antique brass hardware work their way up the 6-inch slip-resistant boots, along with heavy duty wax Sta-tied laces. In an ideal world, we would all have a great bike, and a great pair of American-made boots to wear when riding it. But we don't. Only you are lucky enough to be offered this opportunity to wear what we wear! Get your own Chippewa Men's 25290 Brown Soft Toe Motorcycle Boots order today from Working Person's Store! 28 out of 29 people found this product review helpful. I've had my 25290's for years wearing them for day to day winter wear and a little light hiking now and then and have hardly made a dent in them. The leather, welt and sole are very tough and I love that the sole is both nailed and glued on. As noted by another reviewer, the only place up from these are Wesco and White's for about double the money. Add to this Chippewa's customer service and rebuilding options and they can't be beat. 25 out of 26 people found this product review helpful. Great Boots, the welt gives some contrast and character to the boots. Well made too. I used to buy Doc Martens in this style, I wish I would have found these years ago they blow the Docs away in style and quality for about $20.00 more. Great balance between ruggedness and comfort. I have probably sent back 7 pairs of boots online trying to find the right boots ranging anywhere from $300.00 to $100.00. I would rate these boots 2nd in quality only to my Wesco Harness Boots but they are half the price so the value is excellent. If you like 6" work boots do yourself a favor and pick up a pair of these. I ordered a 9.5EE and they fit me well. I would say they are true to size. Thank you working person store for having the perfect boot. 23 out of 24 people found this product review helpful. Great Value, High quality Boot. In my opinion second in quality only to my Wesco Boots. I believe they are a little more comfortable right out of the box than my Wesco's. I have tried Red Wings, Timberlands, Doc Martens, Vasque, Corcoran and many other boots and these are right at the top with the best of them. Seem to fit well also. Kind of Remind me of some 6" Docs I had but they are build much sturdier. 22 out of 23 people found this product review helpful. This sturdy work boot by Chippewa is made in America from quality materials but sold at a great price. The Vibram lug sole is welted onto the boot, so you can get the boot re-soled whenever necessary. Also, the traction and stability of this boot is great, and you can use it in the mud or even in snow. Of course, I would recommend using a waterproofer for the leather upper prior to using these boots in such conditions. Size-wise, these boots run large, so size down half or a whole size down from what you would wear normally. The leather is a bit thick, so breaking these in may take about a week or more if you do not wear them regularly. After that, this boot becomes very comfortable to wear. 16 out of 17 people found this product review helpful. Just like the logger but a more civil version. Since I was 18 and in the service I have worn 10 1/2 d boots so when these guys came in I was pretty excited to be back in USA made boots, keep in mind every other shoe I own is either 10 1/2 d or 44- 44.5 in size. Though I recently purchased some Patagonia tin sheds that were way to small at the same size. These boots look like tanks and I am sure built to last. I hope a size 10 d fits, any day now. Commendation: I just wanted to say that I felt your service has been very good because I enjoy tracking my packages, and found your system to be very easy and convenient. Your service was fast too. I look forward to purchasing more from you in the future! Chippewa Boots: Men's USA-Made Brown 25290 Engineer Boots is being added to your cart.